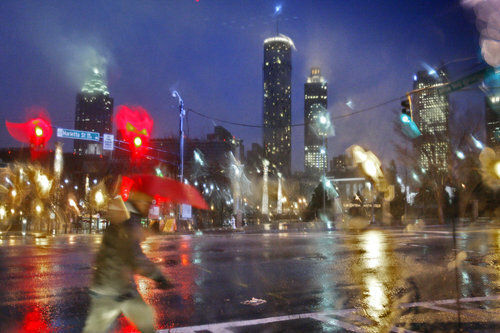 Drive Safely: Rainy Season in Atlanta is Here! Here in Atlanta, the weather system has been delivering quite a bit of rain in these last few weeks and it's showing no signs of letting up any time soon. While this a quite typical this time of year, it's always good to be prepared but most importantly preventive. With just a few simple steps, you can rest assuredly that you've taken all the necessary step to stay safe of the road! Check them out below. Check-up and servicing: During the rain season, servicing is the most essential thing to do. Your car must have gone through scorching heat during long drives during the summer. Hence, it is important to make it ready to face clogged, watery roads in heavy traffic zones which come naturally with the rains. Ensure safe drive during the monsoons. Avoid skidding: Replace cracked tires, check air pressure and make sure the wheels are properly balanced and aligned. This will prevent your car from skidding on a wet road. This is all the more necessary when the first shower arrives. Check the brakes: Make sure that your car brakes are well-oiled and are working properly. You never know when you may have to hit the brakes on a wet, slippery road. Frame protection from rust and corrosion: Your car's metal frame protects the internal components from moisture. So keep it clean and scratch-free to avoid corrosion. As you are well aware, water corrodes metal. Protect your car's paint: Do get a wax coating done just before the rains hit, to protect your cars' paint from the rain. Alternate wet and dry spells can cause the paint to fade and peel. Check your cars' headlights and taillights: Ensure that these are working properly as during a heavy downpour, visibility is poor, not only for you but also for the driver behind you. How Much of a Distracted Driver are You?